A range of useful kitchen accessories that are easy to grip and use effectively. 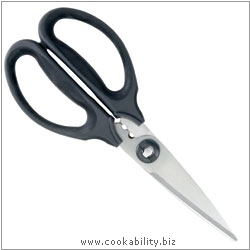 Herb Scissors with soft cushioned grip. Blades are stainless steel with micro-serrations for excellent results. In-built herb stripper. Blades separate for thorough cleaning and sharpening. Hard to beat.